A romantic comedy with Sarah Jessica Parker and Matthew McConaughey – what could go wrong? Well, with my cynicism, I expected this would be awful. I was pleasantly surprised. 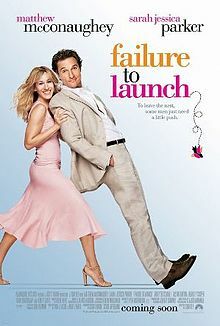 McConaughey plays Tripp, a thirty-something guy who, like all his close friends, still lives at home with his parents. Parker plays Paula, a girl who has made a business becoming romantically involved with guys who are stuck in this situation and giving them the confidence to move on out into the real world. However, despite her plans seeming to go well, everything turns bad, and it is up to the parents and friends to save the couple. I’ve said it before and I’ll say it again; I’m not a massive fan of romantic comedies. But, when they work for me, they really work, and this one worked. Why? I’m not sure. It surprised me. I’ve always liked Sarah Jessica Parker and I think she worked extremely well in this role. Plus Zooey Deschanel played her housemate, and was not bright and perky as usual, but dark and moody, and I liked that too. Look, if you don’t like Hollywood romantic comedies, don’t try this one, it won’t be worth your time. But if you don’t mind them, give it a go. Just try to ignore the stupid animal attacks scenes. They were crap.